Okay, who went and broke the east side of Providence Park? This has already been one weird off season for the Portland Timbers in watching their first ever MLS draft pick leave via trade in December after their coach from the past 5 seasons left back in November. The Western Conference winners from 2017 have been very patient in their search, and right after the Darlington Nagbe trade went official, the team confirmed that they had selected their next head coach, former New York Cosmos coach and MLS legend Giovanni Savarese. 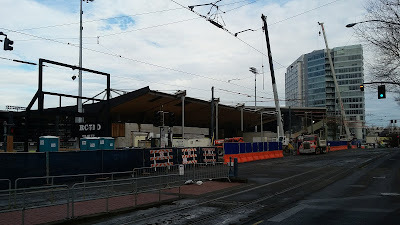 Due to varying schedules and construction at Providence Park and the practice complex in Beaverton, Savarese would not officially meet the Portland media until January 8 in the only conference room available, the post match conference area in the deep concourses in the underground of the park. It was standing room only as over 75 media members gathered to hear the first words of the Timbers' fourth coach in the MLS era. While many outlets were reporting this was the third hire, Portland has had 4 men officially coach the team in the MLS era since 2011: John Spencer, Gavin Wilkinson (on an interim basis), Caleb Porter and now Savarese. Having been at the other two introductory conferences for Spencer and Porter, the energy felt very different between the various announcements were very different. Spencer was an experienced MLS assistant, and I don't think many had put too many expectations forward on a new head coach and a team that was just starting in MLS play. 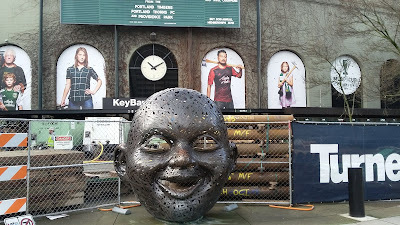 When Porter was officially brought on in 2013, his conference had plenty of intrigue between his background as a successful college coach, questions about the current Timbers roster mostly centered around then Timbers forward Kris Boyd, and firm team expectations starting to be cemented. Savarese comes to Portland with an impressive resume as a player (including being one of the first stars in MLS), youth coach, and coach in lower division soccer. When asked about coming to Portland now after spurning offers from Houston and Minnesota previously, Savarese indicated it was the right time to make the move. Considering the organization, the team and environment, it's hard not to be excited about the potential here. Something looks off here but I can't place it. Savarese mentioned passion, culture and organization several times in his nearly 50 minutes of comments following introductory remarks from Timbers Team Owner and Chairman Merritt Paulson and Timbers Technical Director Gavin Wilkinson that briefly mentioned the interview process. For Wilkinson, it was a matter that Gio "checked all the boxes" for him, which included one surprising addition for many fans - admission that the Timbers had the pieces to be competitive right now. While the Timbers were bounced from the postseason for a myriad of reasons, it's easy to forget that this group finished in the top spot in the Western Conference despite losing several players for extended periods of time. However, Portland isn't exactly the same side either, especially considering Darlington Nagbe is now wearing a red and black hit and playing in the Southeastern United States. At this point of the year, the case could be made that any club could be truly competitive provided the right pieces fall into place, and that's the part that many were concerned about. The Timbers have talent, but they would need fortification in several key areas - most notably center back - to even begin the conversation of being a truly elite side. Paulson talked more about being impressed with Saravese from the first meeting, and the positivity continued in the second interview when Gio brought a full scouting report on the good and the bad of the Timbers, which included ways that he could exploit the current setup and what he would do to mitigate these problems. Many of the follow up questions talked about Savarese's background - former MLS player, international player, youth coach, ESPN analyst, NASL coach - but everything kept coming back to culture and passion. After listening to him for a few minutes, I wanted to run through a wall for him and I don't think balding 51 year old wingers with a questionable first touch and improving fitness will be high on his scouting list. Granted, most of the discussion falls into the common cliches in sports - every match is a final, we want everyone to play hard and compete, everyone will get a chance but they have to work, the season is a grind - but having a former player who is now coaching helps reinforce the point that depth and fitness will be at a huge premium. MLS is a fairly even league where parity reigns, and with matches starting in February to October, it's impossible to play the same collective week in and out to ensure they are healthy come post season. Gio also indicated he's not married to any one playing system either, so it's entirely possible that we could see differing formations depending on player availability, scheduling and scouting. 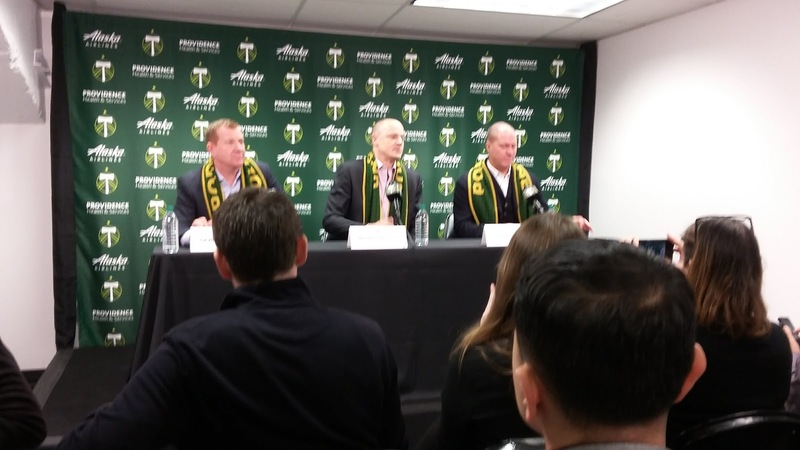 Gavin Wilkinson, Merritt Paulson & Gio Savarese address the Portland media. There will also be input from the Timbers' new assistant coaching group, which underwent some revamping in roles. Sean McAuley, who has been with the Timbers since 2012 when he was hired after the Spencer firing, will remain as a first team assistant, but he will be joined by Carlos Llamosa and goalkeeper coach Guillermo "Memo" Valencia. Cameron Knowles and Adin Brown, assistants in 2016 for the first team, were reassigned to the Timbers 2 team with Knowles being named head coach and Brown joining former T2 Coach Andrew Gregor as his assistants. Familiarity is a big part of these moves by keeping many of the same names and faces, but adding talented and in-demand assistants (Llamosa has been with New England while also being an assistant to Savarese, while Valencia also coached for the Cosmos but had been linked with other jobs) should revitalize the approach, especially since Llamosa and Savarese like to play up tempo soccer building from the back. During his career, Valencia has also been a big advocate and believer in goalkeepers being more than shot stoppers and a true outlet for triggering the offense. In researching the Cosmos, I did see that they varied style and approach quite a lot thus reinforcing the tactic of changing things up to fit the personnel and opponent. I'm intrigued by some of the talent on T2, but 2016 was less than stellar for the Timbers' top affiliated club in every aspect, so it will be interesting to see what Knowles can do with the group. Due to injuries on the first team, many players that were expected to help T2 were actually on the bench for the Timbers, but hopefully that won't be an issue this year. Savarese has a reputation for rewarding hard work in training and playing a mix of veterans and youth, so I'm expecting everyone to get an equal chance to earn the playing time - but they will need to perform and work hard to continue to play. Perhaps that seems very obvious, but I also feel some players portray an attitude of talent enough should be sufficient for me to be playing - and I don't see this approach happening under Gio. Right now, one goal that I would love to see for the entire Timbers and T2 is to truly build a similar platform and approach for both groups. I know Porter mentioned this on several occasions during his tenure, but in the few times I watched T2 in 2016, it didn't seem like that was the case. Whether it was execution, not following instructions, talent or youth going through learning how to play together, getting T2 back on track is as important a goal to me as figuring out the best mix for the first team. Diego Valeri was super human in 2017. Will he repeat in 2018? Savarese admitted the cupboard has some impressive talent, and when you have the reigning MLS MVP on your side in Diego Valeri, that's an impressive building block to start things. But anyone expecting Valeri to duplicate his 2016 output in terms of goals and assists might be disappointed if he doesn't, considering there has been only 2 players in MLS history with over 20 goals and 10 assists in a season. To expect a repeat of that is setting up this side for failure, for as much as I like Diego doing his creative best to aid this team, the Timbers need to establish a truly balanced attack. Getting Fanendo Adi back and healthy is a big start, but integrating him alongside Sebastian Blanco, Dairon Asprilla. Jeremy Ebobisse and the newly acquired Andy Polo is going to be paramount to keeping this attack on target. Polo's deal is intriguing as it's a loan from his parent club Monarcas Morelia for the 2018 season using Targeted Allocation Money with an option to buy; this allows the Timbers to use the TAM acquired from the Darlington Nagbe deal this season without taking on a massive future salary debt until after the season should they decide to exercise the option to keep Polo. I don't think it's possible to completely replace Nagbe within this attack, but having attacking options out wide and keeping Valeri available to patrol the middle and be creative is an idea I like. The Timbers were even able to promote one of their academy products when they signed forward Foster Langsdorf to a Homegrown Player deal this week. Langsdorf finished a productive career in college playing for Stanford University for four years, but Foster also played several seasons for the Timbers academy and for the Timbers U-23 club and was a very good scorer in each stop. As much as having veteran leadership is important, the Timbers must also continue to develop and play their youth by giving them chances to perform when they are earned. Even with adding Polo, Langsdorf and the previously announced Julio Cascante at center back, there are still several questions that need to be resolved during training camp before the Timbers start the regular season on March 4 in Los Angeles facing the L.A. Galaxy. Who is your starter in goal - Jeff Attinella or Jake Gleeson? Does Cascante immediately move into the starting eleven at center back, or do we see Larrys Mabiala and Liam Ridgewell as the starting duo? Behind Cascante, Ridgy & Larrys, who are the main backups at center back, especially since I feel this is a position where the Timbers will need to add more reinforcement. I like Lawrence Olum a lot and he played very well at center back all year, but the club originally signed him as depth in central midfield and I actually think he's a better player there. Does Alvas Powell get the immediate nod to start in defense, or do we see a rotation of Vytas, Valentin, Farfan and Powell depending on who is most fit and fits within the attack strategy? It's actually nice that camp is nearly ready to start and we will start to see some of the answers to these questions, although the aforementioned construction means most matches for the 2018 preseason will be played in Arizona. At this point, it's just nice to see the beginnings of the season start to take shape and fans can all dream of another potential MLS Cup run. Copyright 2008-2018 ©. Kesgard Media. All Rights Reserved. Awesome Inc. theme. Powered by Blogger.